Series books are popular. Kids come to know and love the characters. They eagerly read one book after another and wait for new books to appear. Publishers happily comply. Often, though, you'll come across one that has stereotypical or factually inaccurate content about Native peoples. 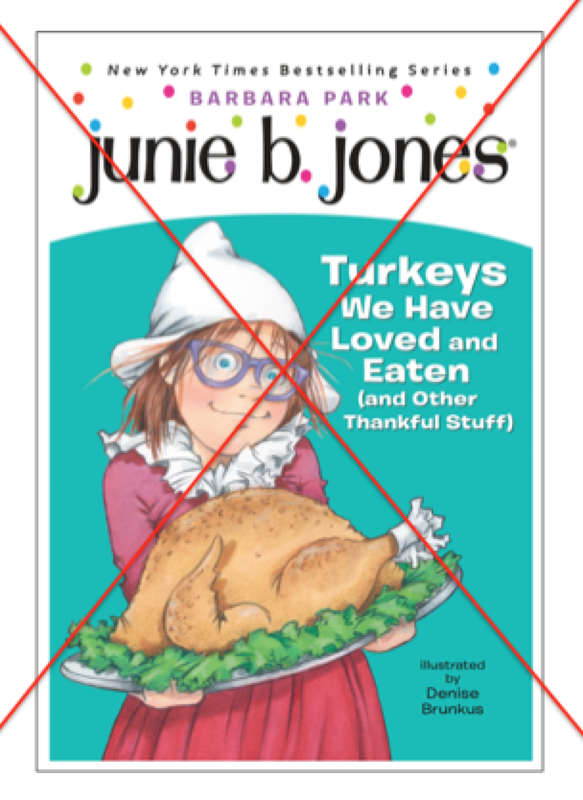 Turkey We Have Loved and Eaten in the Junie B. Jones series is one. Written by Barbara Park, illustrated by Denise Brunkus, and published in 2012 by Random House, it is a good example of a book with problematic content. As such, the red x overlaid on the title is meant to signal that I do not recommend it. Today is the month of Thanksgiving. At Thanksgiving we draw a lot of turkeys. Also we draw Pilgrims and Native Americans. They are eating at a table usually. If Barbara Park or her editor had been thinking critically, "Native American" would be crossed out, too, and Wampanoag would be written, instead. That's the first error in Turkeys We Have Eaten. There's more to the letter. Junie says she doesn't understand the Pilgrims. Their "costumes" (her word) look to Junie like they would make the Pilgrims hot and sweaty. There's the second error. Those weren't costumes. The clothing they wore was... clothing. Junie goes on to write that they're going to have a Thanksgiving feast. Their families will join them at school for this feast. Junie and another girl in the class, May, don't quite get along. This may be a thread in all the books. In this book, they both brought the same item for show and tell. They start to argue about it. Somehow, the Pilgrim costume is brought up, and then, Junie tells May that if she was an Indian.... and that right there (her use of Indian) is the third error. How does that line up with the letter that used "Native American"? When chapter 9 opens, Junie wrotes about how all the kids have to dress up like Pilgrims or Native Americans. She writes that she told her mother that she didn't want to be a Pilgrim but that her mom had asked her grandmother to make the costume and... it is a Pilgrim dress. She has to wear it to school anyway. At school, May comes into the classroom, and she's "dressed like a Native American Indian girl" (Kindle Location 705-706). Remember what I said earlier about being specific? Just what does it look like when someone dresses like a Native American Indian girl? If you're a regular reader of AICL, you know that I've written a lot about how many tribal nations there are, how diverse we are in terms of material culture, social organization, and on and on and on. Obviously, what Park and Brunkus are delivering to readers is stereotypical information. We could call this their fourth error. “Guess what my name is, Junie Jones? My name is Chief May—Chief of Everybody. And I will be bossing around the Native Americans at the feast today. Plus I will be bossing around the Pilgrims, too." “What is your name, little Pilgrim girl?” she asked. “Do you have a name?” I made squinty eyes at her. “My name is Get Out of My Face, Chief Nutball,” I said back. Those early errors are bad, but this whole scene, with the stereotypical clothing and the mockery of Native names takes this book to a whole different level. Now, Turkeys We Have Loved isn't just miseducating kids, it is also mocking Native kids. This is the sort of thing that makes me furious. I think of Native kids in my family, being asked to read things like this. Becoming, via things like this, the target of jokes like this from their peers... Do you see why this is not acceptable? Clearly, Turkeys We Have Loved and Eaten, published in 2012 by Random House, is not recommended. For anyone.